"The girls in charge of our party were amazing! They took care of everything - I didn't have to lift a finger!" "I was impressed with the cleanliness of the rooms and play area. The food catering was great. The staff was helpful and polite." "They were all very helpful and made sure the kids were safe. We all had a good time and enjoyed ourselves!" "The staff was very organized and made it fun and easy." 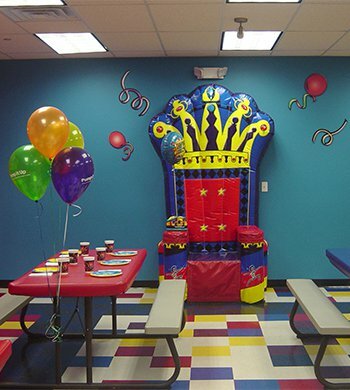 "Everyone was great with the kids and the entire party was very organized. The staff kept me informed of what was going on and what would be happening and when." "The staff was very friendly and informative. It was great not to have to worry about any set up or clean up." "It was easy for parents - staff did a lot to accomodate." "Everyone was very courteous and explained everything thoroughly. When I had questions, the staff answered them. They interacted well with the kids. In the party room, they were very courteous to our guests and helped in every way. They thought of things that I wouldn't have thought of." 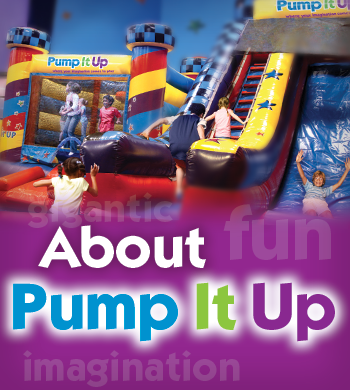 Parents can enjoy Pump It Up too!